1. Earnings deluge: Earnings season hits a crescendo this week, and a ton of big names are reporting Tuesday. General Motors (GM), JetBlue Airways (JBLU), Sprint (S), Caterpillar (CAT), Under Armour (UA), Fiat Chrysler (FCAM), and Lockheed Martin (LMT) are among the companies releasing earnings before the opening bell. Apple (AAPL), Chipotle (CMG), Express Scripts (ESRX), iRobot (IRBT) and Panera Bread (PNRA) are set to release earnings after the close. 2. Apple of my eye: It's fair to say that Apple -- the biggest publicly traded company in the U.S. -- will get most of the attention when it reveals its quarterly numbers after the close. Investors will be looking to see if Apple reports decent iPhone 7 sales, which would support the recent rebound in its stock price. 3. Twitter to cut jobs? : Shares in Twitter (TWTR) could receive extra attention Tuesday after Bloomberg reported the company is considering cutting about 300 jobs. Twitter declined to comment on the report in an email to CNNMoney. Twitter's stock has been volatile lately due to expectations that the company might be purchased by a bigger market player. 4. Economics: A few important economic reports are out Tuesday. The S&P Case-Shiller Home Price Index for August is due at 9 a.m. ET, giving insight into the state of the U.S. real estate market. The U.S. Conference Board is releasing its October consumer confidence report at 10 a.m. This follows an earlier release of business confidence data in Germany, which showed companies were more satisfied with their business situation in October compared to September. "The upturn in the German economy is gathering impetus," said the Ifo Institute in its report. 5. Global market and currency overview: Wall Street is looking rather calm right now. 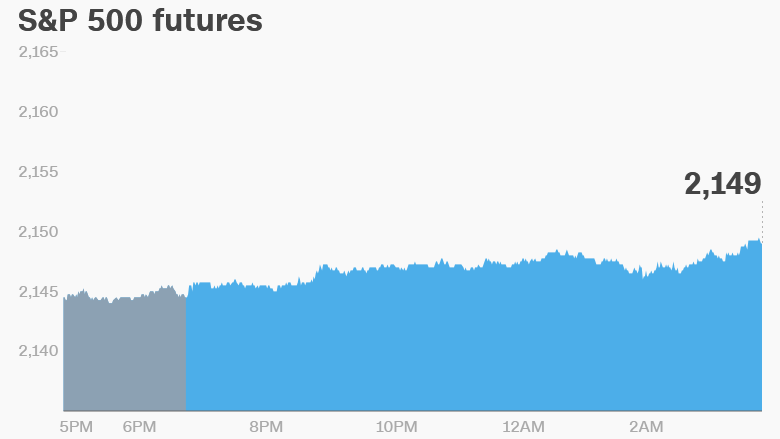 U.S. stock futures are steady following a solid Monday rally. European markets are mostly rising in early trading. And Asian markets ended the day with mixed results. But traders are keeping their eye on the British pound as the head of the Bank of England -- Mark Carney -- is expected to speak today to an economic committee in the British parliament. "The markets will primarily be looking for any hints that Carney and Co. at the Bank of England have plans to cut interest rates further," said Kathleen Brooks, research director at City Index in London. Carney's words have generally soothed traders who are worried about the U.K.'s plans to leave the European Union. The pound has fallen from $1.50 to $1.22 since the Brexit referendum in June.